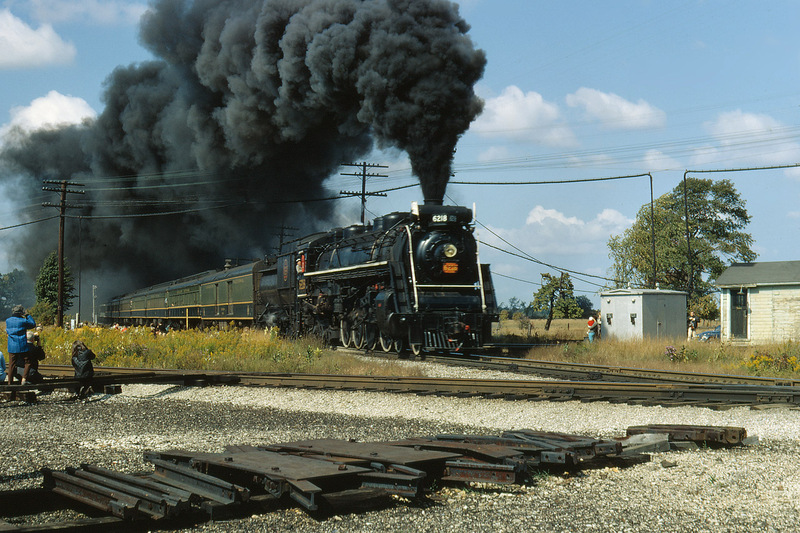 Railpictures.ca - Doug Page Photo: The Upper Canada Railway Society sponsored an excursion from Toronto to Ft Erie on Oct 1, 1967. The destination is simple but how they got there is far from that. Leaving Toronto Union Station at first good light, the train operated via CN’s Oakville Subdivision to Hamilton. From there, it operated via the CN Hagersville Subdivision utilizing the street running along Ferguson Ave, crossing the TH&B mainline and climbing the grade of the Niagara escarpment to Rymal and beyond to Caledonia. Turning east on the CN Dunnville Sub, it continued via Dunnville, Port Colborne and Ridgeway, until arriving at Ft Erie. The return trip was via the Cayuga Sub to Welland Jct, the Humberstone and Welland Subdivision’s to Clifton ( outside Niagara Falls) and then the Grimsby Sub to Hamilton, and finally back to Union on the Oakville Sub again. Here we see Doug’s image of a runpast taking place over the diamonds at Canfield as shutters click and movie tapes roll. | Railpictures.ca – Canadian Railway Photography – photographie ferroviaire Canadienne. Caption: The Upper Canada Railway Society sponsored an excursion from Toronto to Ft Erie on Oct 1, 1967. The destination is simple but how they got there is far from that. Leaving Toronto Union Station at first good light, the train operated via CN's Oakville Subdivision to Hamilton. From there, it operated via the CN Hagersville Subdivision utilizing the street running along Ferguson Ave, crossing the TH&B mainline and climbing the grade of the Niagara escarpment to Rymal and beyond to Caledonia. Turning east on the CN Dunnville Sub, it continued via Dunnville, Port Colborne and Ridgeway, until arriving at Ft Erie. The return trip was via the Cayuga Sub to Welland Jct, the Humberstone and Welland Subdivision's to Clifton ( outside Niagara Falls) and then the Grimsby Sub to Hamilton, and finally back to Union on the Oakville Sub again. Here we see Doug's image of a runpast taking place over the diamonds at Canfield as shutters click and movie tapes roll. In 1957, this happened a hundred times a day on the CNR alone! What a great shot of 6218 doing what she is meant to do! Love the band of passenger cars, too. This say Canadian National steam power!